Up until now I have been an OkCupid loyalist, but after sending over 100 messages and not having any hot make-out sessions I decided to give something else a try. I signed up with Tinder because I have heard that it is a good app to find people to make-out with. After a considerable amount of swiping (swiping right means you like a girl, swiping left means you don’t) I still didn’t find any cute girls that like to make-out. I got a few matches here and there, but never even a phone number, let alone a hot make-out session. I got so distraught it made me desperate. I kept thinking, “It must be me right?” In a fit of anguish I decided to find out the best outcome someone can possibly achieve on Tinder and why I wasn’t. I searched Google images for “attractive guy” (and scrolled down a few pages to make it less obvious), downloaded a few images, and set up my new profile. I was going cat fishing. I made Attractive Guy 26 years old. All of his preferences were set to their maximum values (age 18–55+ and distance up to 100 miles away). He swiped right on every girl Tinder recommended and I kept track of the results. Then I calculated some statistics. The following is what I learned. Attractive Guy did amazingly well. He was liked back by 22.6% of all the females he liked. He also did well across all age groups. 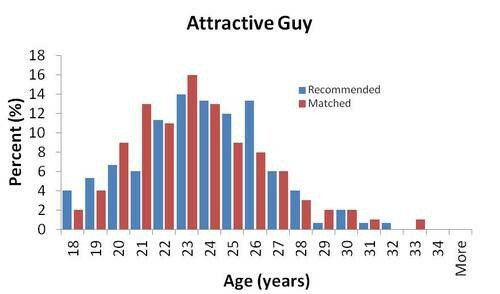 The average female recommended to Attractive Guy on Tinder was 23.7 years old with a standard deviation of 2.9 and the average female that liked him was 24.5 years old with a standard deviation of 2.9. We can conclude that Attractive guy universally appealed to the Tinder female user base. I also created an Unattractive Guy profile. He is 34, a little chubby, but not hideous by any means. He did much worse on Tinder. He was only matched with 0.5% of the females he liked. Additionally, the females that liked him were much older than the average Tinder female. The average age of his recommendations was 23.9 years old with a standard deviation of 3.9 years. The average age of his matches was 28.9 years old with a standard deviation of 5.5 years. We can conclude that Unattractive Guy universally didn’t appeal to the Tinder female user base, especially to women under the age of 29. I knew that age affected Tinder match percents, but I didn’t know to what extent. I decided to make Attractive Guy 34 years old and Unattractive Guy 26 years old to see how much of a detriment being older than the average Tinder female really was on match percentage. What I learned was actually pretty fascinating. Unattractive 26 year old Guy didn’t fare any better than Unattractive 34 year old guy. He only matched with 0.4% of his likes. With so few likes this is probably a statistically insignificant change from Unattractive 34 year old Guy. 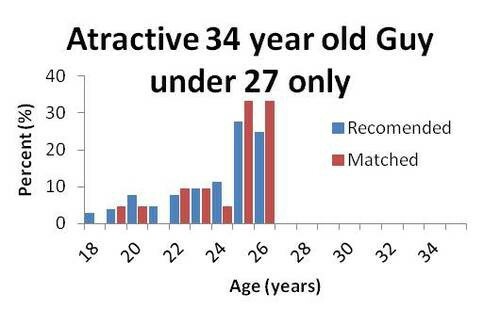 His average match age was lower than Unattractive 34 year old Guy but still higher than the average female on Tinder. I hypothesized that Attractive 34 year old Guy would have a lower match percentage than Attractive 26 year old guy since the average age of female Tinder users was around 24 years old. I was in disbelief when his match percentage was actually 42%! 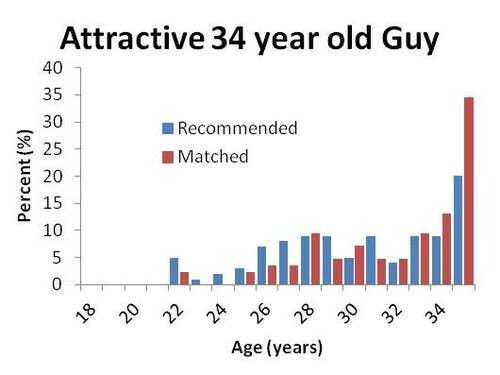 The average age of Attractive 34 year old Guy’s recommendations was 30.8 years old with a standard deviation of 4.8 years. The average age of his matches was 32.8 years old with a standard deviation of 4.7 years. To explain this surprise you have to know that Tinder puts people that have matched you ahead of other people in your recommendation queue. Women over 30 were filtering out younger males on Tinder so they were more likely to find and match with Attractive 34 year old Guy. These matches got put to the top of his queue. So being an attractive older guy helps you with older women, but does it hurt you with younger women? To find out I set Attractive 34 year old Guy’s to only search for women under 27 years old. The answer is a resounding no. Attractive 34 year old Guy matched with 18.9% of the women under 27 years old he swiped right on. This is only slightly less than Attractive 26 year old Guy. The average age of these women was 23.7 and the average age of his matches was 24.3. Attractive 34 year old Guy didn’t pay much, if any, penalty for being 10 years older than the average female on Tinder. Apparently for males attractive is attractive at any age. So what did I learn? Tinder actually can work, but pretty much only if you are an attractive guy. Your age doesn’t matter as much as your level of hotness. So what do you think? Has Tinder worked for you? What age group do you look at compared to your age? What percent of people do you tend to swipe right on? Is there anything else you would like to know about Tinder? Let me know. Until then, happy cat fishing.